In New York, where a parking spot can cost up to $1 million, it’s important to realize just how much space one single car really takes up. 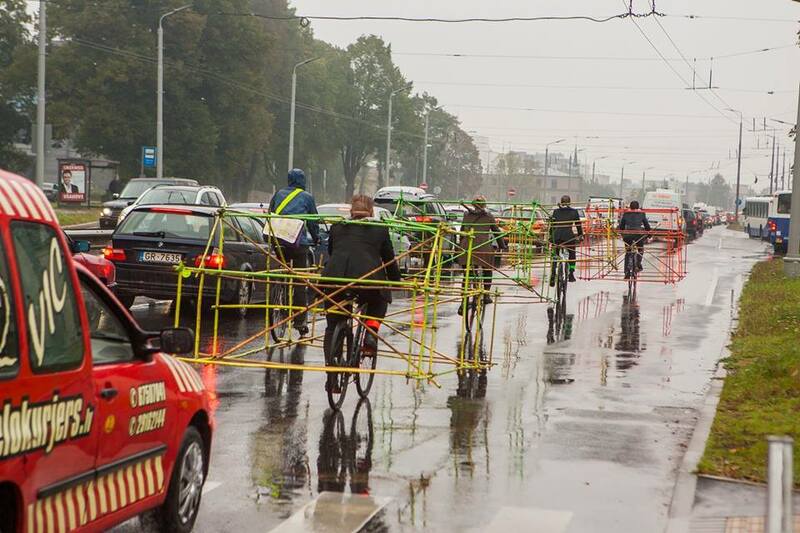 As part of the 2014 edition of European Mobility Week, a group of Latvian activists got this message across with some truly out-of-the-box methods. 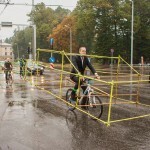 The activists are part of the advocacy group Let’s Bike It, and the goal for their recent project was to create a visual commentary about the space taken up by cars on a typical road. 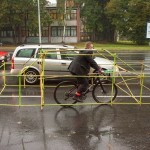 In doing so, the group fabricated bamboo structures that resembled the shape of a car and mounted them to their bicycle frames. 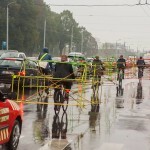 They then road their cycle-monstrosities through the streets to demonstrate the absurdity of operating large cars to transport a single person. The vehicle-sized skeletons were painted with bright colors to ensure their visibility on the road. 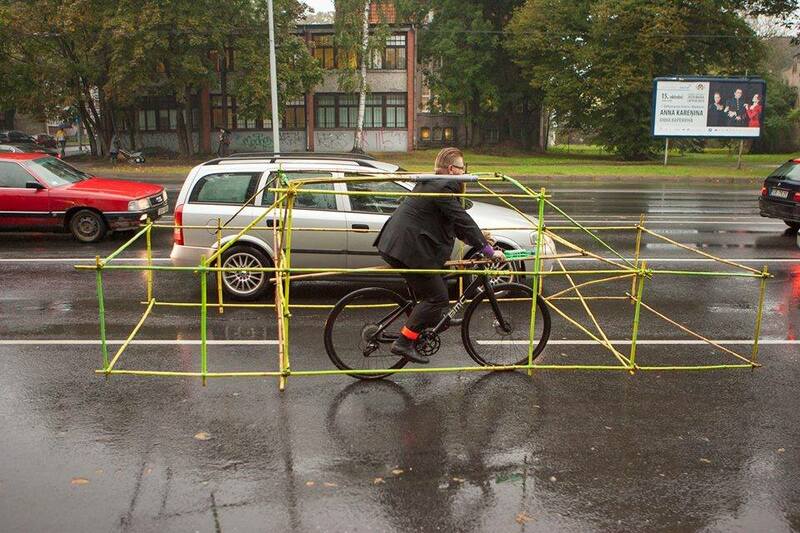 Just how far the structures extended truly represented the difference in size between a bicyclist and a driver. 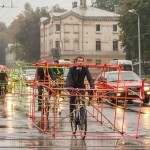 European Mobility Week is an annual campaign focused on topics related to sustainable urban mobility and is organized through the support of the Directorates-General for the Environment and Transport of the European Commission. 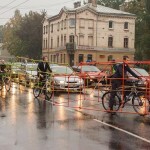 The end goal for the campaign is to promote to local European authorities different ways of introducing sustainable transportation methods to the public. This year’s event featured a variety of engaging activities including workshops, concerts, and art competitions, all exploring different themes around the role of sustainable transportation, efficient usage of land, and how these two things can influence and improve one’s quality of life. 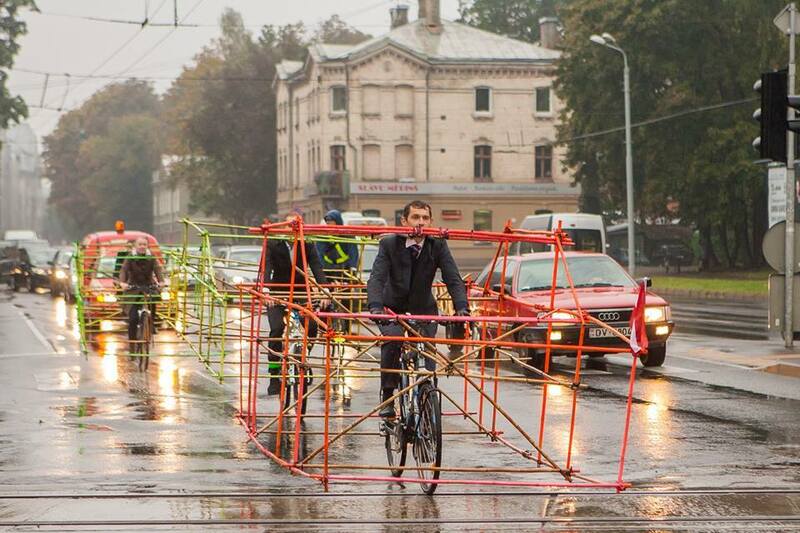 We won’t be surprised if similar bike advocacy efforts pop up in New York soon. Just yesterday, Citi Bike announced that it had been saved and will double in size by 2017 to 12,000 bicycles and 700 docks, a sure sign that bicycle culture in NYC isn’t going anywhere.